One of the many things on my bucket list is to run a marathon. I’m not alone in this respect; many people list this as a bucket list item, but very few actually go on to do it. But when I started taking running seriously, I started realizing this goal could eventually become a reality. Then I started doing some work on a website devoted to half marathons, and come on, working on a half marathon website was kind of silly when I had never actually run one. 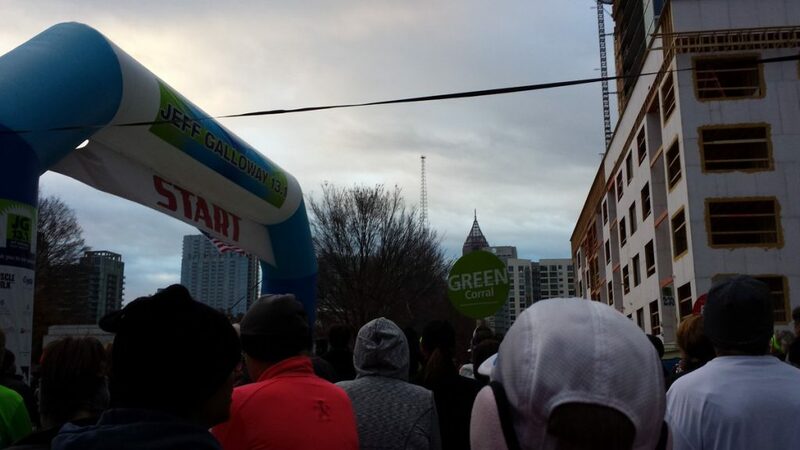 So I signed up for the Jeff Galloway 13.1 Half Marathon, a walker-friendly half marathon right here in Atlanta. Last Sunday morning, I found myself willingly standing in the cold, bundled up and waiting to run thirteen miles outdoors in December. Hey, it sounded like a good idea back in (much warmer) May when I signed up. 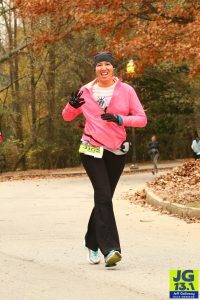 This outfit worked well in keeping me warm and dry throughout the race. Gold star, past self. 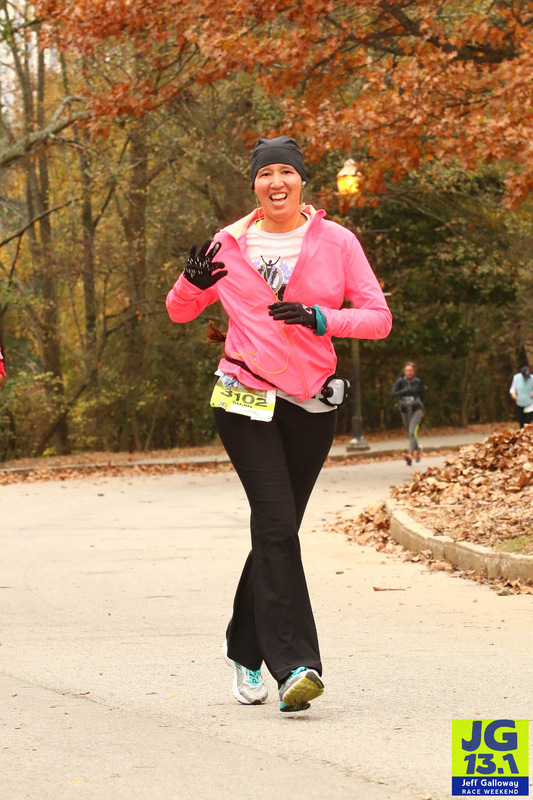 I didn’t find myself very cold once the race had begun, although I did make my way to gear check five minutes after crossing the finish line. I arrived at the start line a little over half an hour before go time. Like me, plenty of folks had bundled up in jackets, but others had gotten more creative: in robes and blankets and garbage bags (and a few in all three). I found myself talking to people who traveled from Iowa (Hi Ann in the red blanket!) and Florida (I can’t remember your names, sorry! But I do remember the lack of hills in Florida). Now that’s dedication. There aren’t too many things I’d travel that far for. We waited and talked, holding on to our warm top layers for as long as possible before surrendering to gear check; fortunately I was standing right next to the gear check truck. Someone sang the national anthem. The fast group was off. The still-faster-than-me group was off. And before I knew it, I found myself walking to the start line along with everyone else in my start group. Here we are, waiting for the race to start. And we were off! I had talked to the race’s namesake during the expo about first-timer tips, and he mentioned starting off slowly. I was already planning on this, but it was good to hear anyway. I was passing people and still running at a slow and steady pace during the first few miles as we weaved through the streets of Midtown and my neighborhood, heading toward part of my regular running route. This was very helpful for me since the excitement was starting to wear off and now I could motivate myself by physical landmarks instead of looking for the event’s distance signs. Around mile five, thoughts of bagels invaded my mind. I had eaten a big bowl of cereal that morning, but apparently that wasn’t enough, and I didn’t bring extra food with me. It didn’t help that the race route took me past so many familiar (and a few unfamiliar) places that I knew had food and heat and bathrooms and… why was I doing this again? I could be snuggled up under a bunch of blankets and not running. For the first eight miles, I walked only through the water stations. But just past the mile eight water station, my left knee started to hurt. I obeyed its wishes and slowed down for awhile, picking up the pace again after a short break until the knee complained again, repeating this pattern up and down hills and adding an extra ten to twelve minutes to the last 6k of the race. By the time I passed the mile ten water station, my bladder couldn’t hold it in any longer. I took advantage of my knee pain to relieve myself. This portapotty was cleaner than I was expecting, probably because the objective at this point was to cross the finish line, no matter what it took. The minute or so I added to my final time was worth the break that let me run more than walk for that last 5k. It would all be over soon, I told myself. I’d get to bite into bagels and have more water and get my big jacket back and get off my feet for the rest of the day. A mile later, the race course entered Piedmont Park, greeting me with more familiar training run territory and more knee pain, but who cared? I was almost done! I took several walk breaks, with the knee cooperating just enough not to concern me. I weaved through the park, passing the dog park and going up and down the small hills in the northern part of the park, then made my way around the lake where I could hear cheers. There was no giving up now. It was time to do the thing. And I walked around the corner, then took a slow and steady jog to the finish line, speeding up as I crossed that line. The exhilirating feeling running through me as I crossed the finish line is one I’ve felt few times in my life, all of them associated with major accomplishments of some kind. Winning my first NaNoWriMo. Finishing up a particularly challenging semester in college (so… my last three semesters). Figuring out a major mathematical concept. It’s a sensation I never want to forget. You can’t see it, but my hair is in a very long braid behind me. Image courtesy of True Speed Photo. There were no bagels at the finish line, but that first bite of blueberry muffin was a small bite of heaven. I would say “find someone who looks at you the way a runner looks at carbs after a long run”, but let’s be honest, there’s not much looking involved and more shoving muffins down one’s gullet. 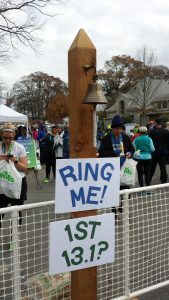 I took advantage of all the snacks, talked to people (including Ann from Iowa again, who had finished about ten minutes before I did and reclaimed her red blanket), and rang the first half marathon bell so hard the ringer nearly fell off. This almost makes up for not getting to ring the bell at Night of Writing Dangerously. Almost. Not quite. And then went back for another muffin. You bet I rang the crap out of that bell. After that, I ate a burger with French toast for buns, topped with bacon and eggs. I then spent the rest of the day in bed with the promised book and blankets. My final time? 2:26:43 chip time, 2:32:49 gun time. Not too bad for a first-timer. I was so close to reaching my dream goal of finishing faster than the Hamilton cast recording could play (2:22:13). I was less than five minutes off, with the final song finishing as I rounded the last big corner. The good news is that with sufficient training, I can surely reach this goal with my next half marathon. Yes, I said next half marathon. I have personal bests to beat, after all. Besides that, running a full marathon is on my bucket list, and training for a half marathon leads naturally to training for a full marathon. There are lots of excuses, but let’s face it. If I’m training for a full marathon, I can’t slack off the way I did this time, especially once my long runs start reaching two or three hours and even more. My knee was not happy with me when I crossed the finish line, and my legs weren’t happy for three days afterward. Most of the full marathons that I can get to easily are here in Atlanta or where I grew up in north Georgia. I have my options, which is one advantage to living in a large city. What I have less of is flexibility in my training. It turns out that all the full marathons in these areas are in March, October, or November. Doing a March event means the most rigorous training takes place during NaNoWriMo and during the winter months. This means cold and noveling can get in the way of my training. However, it’s worth noting that the prime choice for a March marathon is also here in Atlanta, meaning less travel time for me. On the other hand, an October or November marathon means the longest runs will take place during the summer’s heat and humidity. In the case of a November marathon, there’s also the obvious downside of occupying a November weekend day with a marathon, especially when my November weekends are already crammed enough as it is. The October and November marathons nearish me would also involve more travel during the time of year when time is at a premium. No matter which event I choose, one thing is clear: running a full marathon is a huge commitment, not just in the event itself, but in all the training leading up to race day. What I can do now is continue running through the winter, then start my training in 2017 in preparation for a 2018 marathon. This entry was posted in Life and tagged running by Sushi. Bookmark the permalink.